An additional open house opportunity was requested for four of the five properties originally shown on December 10. This will be the final open house for the properties listed and anyone may attend. 2115 Bryant Ave. N. 8:15 a.m. – 8:55 a.m.
2934 Queen Ave. N. 9:00 a.m. – 9:40 a.m.
2102 25th St. N. 10:30 a.m. – 11:10 a.m.
*Note – 3115 Knox Ave. N. may only be accessible through the rear door. One staff person is opening, securing, and travelling between houses, so actual open times may be up to 5 minutes late. Please be patient and plan accordingly. As posted on the vacant structure list, the due date for submitting an offer for these properties, as well as 2701 Oliver Ave. N., is December 23 by 12:00 p.m.
January Open Houses Coming Up Soon! Eight new vacant structures are available for purchase in January. Open houses will be on January 7 and January 14from 1:00 – 2:00 p.m. for four properties each day. Pictured is 3534 Fremont Ave. N., one of the houses featured in January. Visit our website for information about how to submit offers, obtain financing, and participate in the Vacant Housing Recycling Program. Over 300 lots available for new homes! A new guide for the Vacant Housing Recycling Program’s interactive property map is posted on the website, making it easier to search for vacant lots and structures that are available for purchase. Also posted is a new financial resource guide for residents interested in constructing a new or rehabbing an existing home to live in. Check out 2609 Quincy St NE, a 46′ x 182′ property for sale in North East Minneapolis! The property is for sale for $37,400 and is over 8,700 square feet total. This property and many more are listed on the vacant lot list. 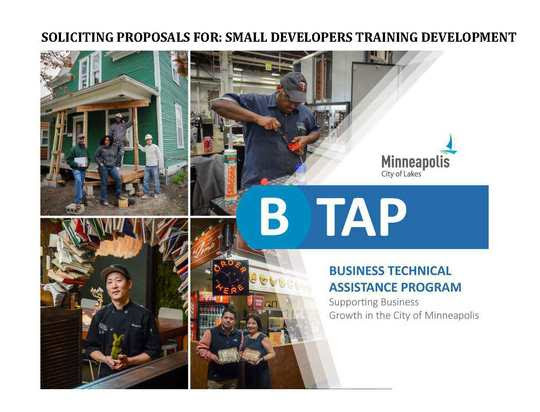 The City of Minneapolis is seeking proposals from developers to create a Small Developers Training. The goal of the training program is to build capacity of women and minority-owned developers in the City of Minneapolis.